Context: Long-term exposure to volatile organic compounds (VOCs) affects the occupancies health in petrochemical complex. Objectives: The aim of this study is to apply the lifetime cancer risk (LCR) and hazard quotient (HQ) in occupational exposure to estimate the risk of VOCs in petrochemical complexes. Settings and Design: A cross-sectional study was conducted in the petrochemical complex of Iran for a period of 1 year. Materials and Methods: Sorbent tubes were used to obtain air samples from 169 workers at different petrochemical complexes in southern Iran. The compounds analyzed with gas chromatography equipped with a flame ionization detector (FID). Statistical Analysis Used: The data were analyzed by SPSS version 16. Comparison between the mean of pollutants concentration in personal samples was performed by one-way analysis of variance (ANOVA) test. Results: For all groups of workers, the results showed that exposure to carcinogenic compounds leads to LCR risks higher than 1 × 10-6. The mean of LCR for benzene is more than 10-4, and 53.3% of workers' exposed has a definite risk; the mean of LCR for workers exposed to ethyl benzene, epichlorohydrin, styrene, and trichloroethylene was between 10-4 and 10-6 and workers' exposure to these compounds was a probability risk for cancer. The mean of HQ was less than 1 for workers exposed to toluene, p-xylene, chlorobenzene, phenol, and methanol. Conclusions: The risk assessment with LCR showed that carcinogenic compounds are the main threat to workers' health and precautions should be taken to control workers' risk. The Petrochemical Special Economic Zone is located in the southern part of Iran, near the northern coast of the Persian Gulf. The zone now covers 2,600 hectares. Twenty-one huge petrochemical complexes have been planned for this area and about 8,000 people are employed there. The petrochemical industries are consumption oriented; many gas refineries and chemical processes used in factories produce raw material for many local downstream industries; also, petrochemical products are exported to European and East Asian countries. Many pollutants are emitted into the ambient air from petrochemical refineries, and aromatic and aliphatic hydrocarbons constitute a significant portion of these pollutants. Many health effects result from exposure to volatile and semi-volatile pollutants in petrochemical complexes. The major potential health effects from volatile organic compounds (VOCs) include acute and chronic respiratory effects, allergies, asthma, neurological toxicity, lung cancer, and eye and throat irritation., The International Agency for Research on Cancer  has categorized benzene and trichloroethylene as definite carcinogenic chemicals (group 1), epichlorohydrin, tetrachloroethylene as probably carcinogenic (group 2A), and ethyl benzene and styrene as possibly carcinogenic for humans (group 2B). Various scholars have studied the concentration of pollutants in petrochemical complexes in Iran. For example, Maghsoodi et al. studied the distribution of hydrocarbons in the ambient air of the workplace. They assessed the effects of atmospheric parameters such as wind speed and direction, temperature, and humidity on the spreading of pollutants. The study reported that the frequent prevailing wind speed in the region and temperature play a major role in the distribution of pollutants from petrochemical factories. Rahimpour et al. determined the urinary biomarkers of workers' exposure to VOCs in petrochemical complexes and reported that the concentration of urinary trans, trans-muconic acid of some workers is higher than the biological exposure index (BEI) recommended by the Ministry of Health and Medical Education of Iran. Moradpour et al. identified hydrocarbons in ambient air of petrochemical complex in Iran and reported the distribution of air pollutants in the summer to be higher than in the winter. In addition, Neghahban et al. measured the concentration of benzene and epichlorohydrin in some petrochemical complexes in Iran and reported that some workers' personal exposure concentrations were greater than Iranians' occupational exposure limits (OELs). Scholars from across the globe have studied health risk assessment over the last two decades. Most epidemiological studies have focused on the evaluation and risk assessment of VOCs in indoor and outdoor environments and the atmosphere near industrial sites.,,, A few studies have also investigated risk assessment for occupational exposure in photocopy centers and small enterprises., Chan et al. measured air toxins with open-path Fourier transform infrared spectroscopy (OP-FTIR). Their analytical method was based on a real-time instrument and could not be used for personal sampling of workers' exposure. In most chemical assessments of occupational health, the concentrations of compounds were measured over 8 h and then compared with a threshold limit value (TLV). Whenever different compounds exist in workplaces, the compounds are compared with mixture TLV  while other influential factors, such as age, exposure time in a week, exposure frequency in a year, duration of exposure, average lifetime, body weight, and number of working days per year, are not considered in these assessments. All of these parameters affect workers' health. We have not seen any research on occupational risk assessment in petrochemical complexes that used lifetime cancer risk (LCR) for the quantitative assessment of carcinogenic compounds and hazard quotient (HQ) to estimate the risk of confronting hydrocarbons that are not carcinogenic. The aim of this study is to apply LCR and HQ to estimate the risk of VOCs in petrochemical complexes so as to protect workers and prevent undesirable effects of workplace hydrocarbons. This study was carried out in 21 petrochemical complexes in Iran from December 2013 through March 2014 and from June through August 2014. A total of 338 personal air samples from 169 workers was randomly gathered by using a stratified sampling method employed with similar exposure groups (SEGs) at petrochemical complexes. SEGs are groups of workers having the same general exposure profile for the agent(s) included in the exposure assessment because of the similar nature and frequency of tasks they perform, the materials and processes with which they work, and the similarity in the way they perform their tasks. SEGs were determined through observation, dividing the operation or plant into separate petrochemical complexes, then dividing workers by job category, and also referring to former exposure monitoring in each petrochemical complex. The size of SEGs is shown in [Table 1]. The subjects were randomly selected in each population group and initial training was performed regarding the personal sampling. Each worker completed a detailed questionnaire about his age, weight, duration of occupation, and smoking habits. All of the workers were male. The worker groups with similar exposure consisted of mechanics, security, samplers, site men, technicians, laboratory staff, and office workers. Samples were collected and analyzed in accordance with National Institute for Occupational Safety and Health (NIOSH) methods for determination of hydrocarbons in the ambient air. Sorbent tubes, such as charcoal tubes, silica gel, and XAD (SKC, USA), were used for personal air sampling of nonpolar compounds and polar compounds. The sorbent tubes were connected to a personal sampling pump and a 100–200 mL/min flow rate was used to take samples; sampling lasted for 3.5–4 h. For each subject, two samples were collected over 8 h of exposure time. The adsorption tubes were attached to workers' overalls near the breathing zone to obtain personal samples. A field blank sample was obtained with each group of samples in the workplace. The samples were transported to the laboratory and the front and backup sections of sorbent tubes were transferred to two separate vials. The samples were analyzed by chromatography methods after desorption of analyte with chemical solutions. Gas chromatographic analyses were carried out using a Shimadzu GC-2010 system (Kyoto, 81 Japan) equipped with a split-split less injector and flame ionization detector (FID). Ultra-pure N2 was used as a carrier at a flow rate of 1.1 mL min -1. The oven temperature was initially kept at 30°C for 10 min and gradually increased to 100°C at a rate of 4°C min -1 and then to 200°C at a rate of 20°C min -1. The injector and detector temperatures were set at 220°C and 250°C, respectively. Chromatographic separation was carried out using an Rtx-5 (30 m × 0.25 mm × 025 μm) fused silica capillary column from Restek (Bellefonte, PA, USA). The calibration standards were prepared by diluting the stock standard mixtures of 20 VOCs. Then, the working standard in levels from 1 μg/mL to 100 μg/mL was prepared from the standard concentrations. To determine the quality of the samples, the Gas Chromatography-Mass Spectrometry Varian Model CP-3800 was used. Separation of hydrocarbons was accomplished with a capillary column (25 m × 0.22 mm ID BP10). The temperature was programmed for 35°C for 4 min and increased to 180°C at a 4°C/min rate, followed by 6 min held at 180°C for 1 min. Helium was used as a carrier gas with a flow rate of 1 mL/min 1 and a split ratio of 1:6. Ca represents the concentration of chemicals in the ambient air (mg/m 3), W the mass, μg the analyte found in the sample sorbent sections, and B the mass of analyte in blank sorbent sections. 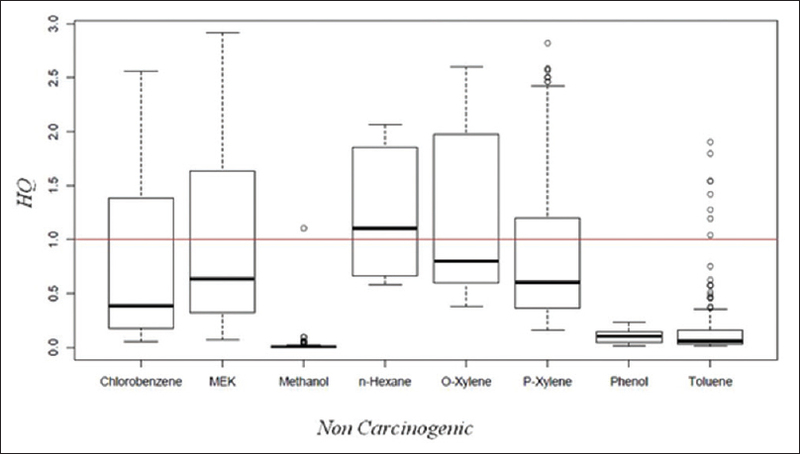 To quantify the health risks of workers in a petrochemical complex, carcinogens are distinguished from noncarcinogens. where LCR denotes the lifetime cancer risk, CDI is chronic daily intake, and SF represents the cancer slope factor. The SF is the slope of the dose–response curve at very low exposures. The dimension of the SF is expressed as the inverse value of daily intake (mg/kg/day)−1. where Ca represents the concentration of chemicals in the ambient air (mg/m 3) and calculated from equation (1) IR the inhalation rate (m 3/h); ED denotes the exposure time (h/week); EF represents the exposure frequency (weeks/year); L is the length of exposure (years); BW is the body weight (kg); AT is the average time of lifetime exposure (period over which exposure is average); NY is the number of days per year. For calculation of risk assessment, life time, average body weight, and amount of air breathed per day assumptions are based on suggestions from the United States Environmental Protection Agency. In this study, the inhalation rate of 8.5 cubic meters per day, an entire lifetime (AT) of 70 years, and an exposure time (ED) of 40 h/week were applied to all groups of workers. Body weight (BW), exposure frequency (EF) per year, number of days per year, and length of exposure (L) were determined from the questionnaires. Unlike cancer risk, noncancer risk is expressed in terms of the HQ, defined as the ratio of the estimated exposure (Ca in mg/m 3) of an individual to the reference concentration of compounds in the air. Data analysis was performed with SPSS (version 16) statistical software for windows. Comparison between the mean of pollutants concentration in personal samples was carried out by one-way ANOVA test. [Table 2] shows the mean concentration and OEL concentrations of the VOCs considered for the risk assessment estimations in each petrochemical complex. In general, the most often quantified compounds (≥85%) were benzene, toluene, ethyl benzene, m-, p-xylene, o-xylene, methanol, methyl ethyl ketone, and epichlirohydrin. Other VOCs such styrene, chlorobenzene, trichloroethylene, phenol, and n-hexane were detected in more than 25% of the samples. The average of benzene concentration in all petrochemical complexes was less than the OEL limit recommended by the Ministry of Health and Medical Education in Iran  but concentrations of benzene exposure obtained in petrochemical complex numbers 5, 6, 10, 12, 13, 14, 18 were 30%, 15%, 17%, 20%, 18%, 37%, and 40% respectively, of workers samples more than OEL limits. The concentrations of epichlorohydrin exposure in petrochemical complex numbers 5, 6, 7, 17, 21 were 18%, 28%, 50%, 15%, and 17%, respectively of workers samples exceeding OEL limits. 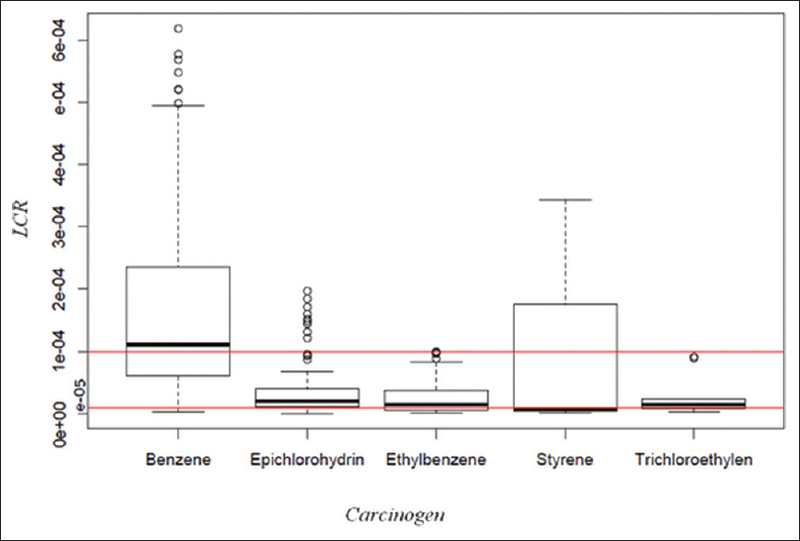 [Figure 1] shows the individual LCRs for the five hydrocarbons found in the samples in petrochemical complexes. 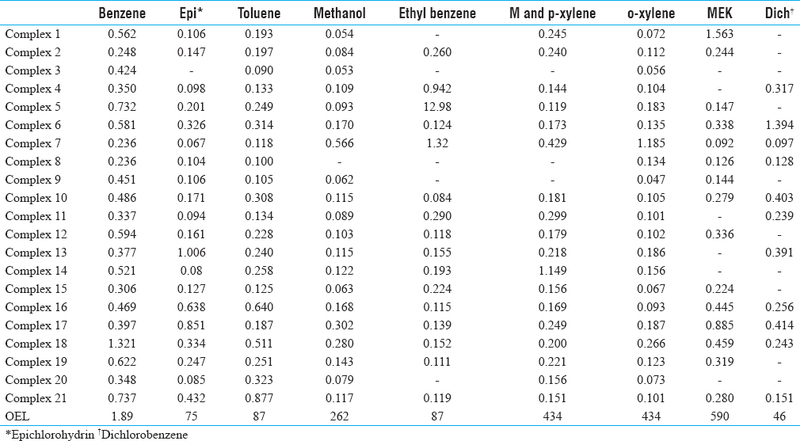 Benzene has a high risk in all petrochemical complexes (53.3% definite risk, 44.4% probable risk, 1.2% possible risks, and 1.2% without exposure to benzene). The highest risk for ethyl benzene, trichloroethylene, and styrene was in complex numbers 5, 18, and 9 respectively. Styrene and trichloroethylene were found in 2% of samples. [Figure 2] shows the HQ of noncarcinogenic hydrocarbons in each petrochemical complex. The average HQs were less than 1 for most of hydrocarbons but the HQs of n-hexane were more than 1, which can indicate that workers' exposure to this compound needs more attention. Monitoring results revealed that VOCs levels were much higher in mechanics and samplers than in other exposure groups. The highest risk for all of noncarcinogenic compounds was in complex numbers 7, 17, and 18. This research was undertaken to assess the health risk of workers' exposure in a petrochemical complex. LCR model was used to assess carcinogenic compounds and HQ to estimate the risk of noncarcinogenic hydrocarbons. The parameter that affects workers' cancer risk should be calculated with the LCR model. This method can evaluate the effects on workers' health and determine the treatment required for exposure to a specific pollutant. Some international organizations such as the World Health Organization (WHO), the United States Environmental Protection Agency, and the United States Food and Drug Administration (USFDA) have recommended quantitative risk assessment as a basis for regulatory decisions about chemical mixtures. The main risks for workers' exposure in petrochemical complex related to carcinogenic compounds include benzene, styrene, ethyl benzene, epichlorohydrin, and trichloroethylene. Based upon toxicity data, benzene represents the greatest threat of the VOCs present in the petrochemical compounds, because the mean of LCR for benzene is more than 10-4. The World Health Organization  considered as “acceptable,” an LCR under the range between 1 × 10-5 and 1 × 10-6 whereas the United States Environmental Protection Agency (USEPA) recommended an LCR under 1 × 10-6., Exposure to benzene vapors poses hazards to human health. Moreover, occupational exposure to benzene has been linked to the development of leukemia. Chronic exposure to even a low concentration has been correlated with other adverse changes such as aplastic anemia. These findings support the notion that workers in intensive petrochemical industry environments may have higher potential health risks than the rest of the population. The pollutants are emitted from industrial plants into the workplace's ambient air during the refining, production of solvents, polymers, storage, leaking from the reservoirs, the transport pipelines, and installations. These processes cause the concentration of some pollutants to go beyond the safe level. A case-control study of occupational exposure and intracranial tumors among employees in a petrochemical research facility indicated that occupational exposure may have contributed to excess of glioma. Another case-control study from Taiwan found an association between petrochemical air pollution index and deaths from brain cancer, with the odds ratio in the highest tertile being 1.65 (95% CI 1.00–2.73). An ecological study of leukemia close to an oil refinery in western Sweden revealed 19 cases in two exposed parishes between 1995 and 2004 in comparison to the expected 8.5. As the exposure estimates indicated very small elevations of benzene and olefins, this result was unexpected. Some precautions should be taken to control the risks of exposed workers, such as control of leaking, increased ventilation to dilute VOC concentrations, periodic health examinations for workers, and periodic monitoring of VOC. Local exhaust ventilation is also recommended for removing pollutants that accumulate in specific areas. Health training should be emphasized for all workers. This research was carried out with the LCR Model for carcinogen and HQ for noncarcinogenic compounds in huge petrochemical complex in Iran. The risk assessment with LCR was showed the benzene is main threat for workers health in petrochemical complex as the average of LCR for benzene was more than 10-4. Styrene, ethyl benzene, epichlorohydrin, and trichloroethylene have also high risk in some petrochemical complex. The maximum HQ for five noncarcinogenic compounds was 2 to 3 in some petrochemical complexes and needs emergency care. Some precautions should be achieved to control the risk faced by workers. Additional studies are needed to characterize the risk of inhalation exposure to VOC among people living in the vicinity of a petrochemical complex. This research was supported by Vice-Chancellor of Research and Technology, Hamadan University of Medical Sciences, Islamic Republic of Iran. PETZONE. Petrochemical Special Economic Zone. PETZONE, 2016. Available from: http://petzone.ir/rha/. [Last accessed on 2018 Feb 17]. Rumchev KBH, Spickett J. Volatile organic compounds: Do they present a risk to our health? Rev Environ Health 2007;22:39-55.
WHO. Household air pollutants from non-combustion sources. Available from: http://www.who.int/airpollution/household/pollutants/noncombustion/en/. [Last accessed on 2018 Feb 17]. IARC. IARC monographs on the evaluation of carcinogenic list to human, list of classification. Available from: http://monographs.iarc.fr/ENG/Classification/latest_classif.php. [Last accessed on 2018 Feb 15]. Maghsoodi Moghadam R, Bahrami A, Ghorbani F, Mahjub H, Malaki D. Investigation of qualitative and quantitative of volatile organic compounds of ambient air in the Mahshahr petrochemical complex in 2009. J Res Health Sci 2013;13(Suppl 1):69-74. Rahimpoor R, Bahrami AR, Ghorbani Shanha F, Assari MJ, Negahban AR, Rahimnejad S, et al. 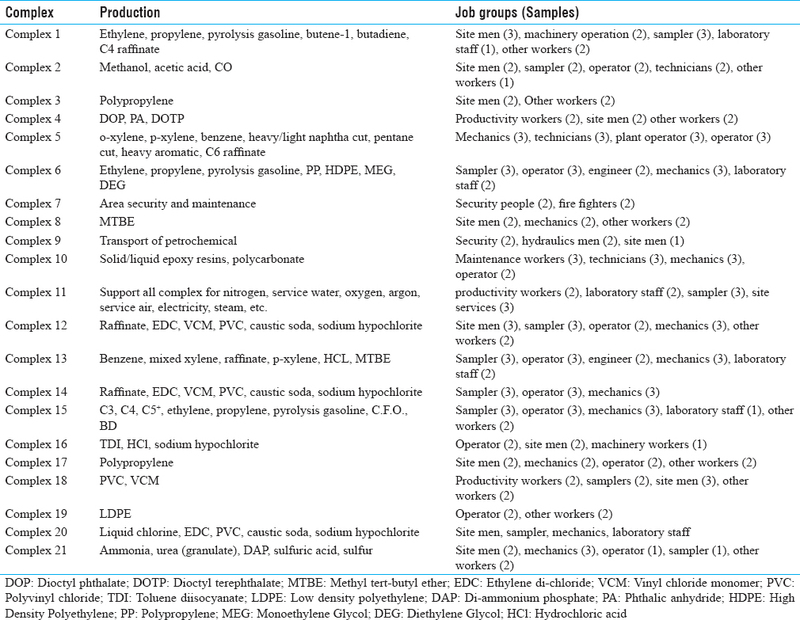 Evaluation of Urinary Metabolites of Volatile Organic Compounds and Some Related Factors in Petrochemical Industry Workers. J Mazandaran Univ Med Sci 2014;24(Suppl 116):119-31. Moradpour Z, Bahrami A, Sultanian A, Ghorbani Shahna F, Negahban A. Seasonal comparison of emissions of volatile organic compounds in the chemical industry based on oil during the years 2013 and 2014. Iran Occup Health 2014;11(Suppl 6):55-63. Negahban AR, Ghorbani Shahna F, Rahimpoor R, Jalali M, Rahiminejad S, Soltanian A, et al. Evaluating Occupational Exposure to Carcinogenic Volatile Organic Compounds in an Oil-Dependent Chemical Industry: A Case Study on Benzen and Epichlorohydrin. J Occup Hyg Eng 2014;1(Suppl 1):36-46. Thepanondh S, Varoonphan J, Sarutichart P, Makkasap T. Airborne Volatile Organic Compounds and Their Potential Health Impact on the Vicinity of Petrochemical Industrial Complex. Water Air Soil Poll 2011;214:83-92. Zhou J, You Y, Bai Z, Hu Y, Zhang J, Zhang N. Health risk assessment of personal inhalation exposure to volatile organic compounds in Tianjin. China Sci Total Environ 2011;409:452-9. Guo H, Lee, SC, Chan LY, Li WM. Risk assessment of exposure to volatile organic compounds in different indoor environments. Environ Res 2004;94:57-66. Ramírez N, Cuadras A, Rovira E, Borrull F, Marcé RM. Chronic risk assessment of exposure to volatile organic compounds in the atmosphere near the largest Mediterranean industrial site. Environ Int 2012;39:200-9. Colman JE, Sanchez EY, Sambeth JE, Porta A. Characterization and health risk assessment of VOCs in occupational environments in Buenos Aires Argentina. Atmos Environ 2012;55:440-7. Lee CW, Dai YT, Chien CH, Hsu DJ. Characteristics and health impacts of volatile organic compounds in photocopy centers. Environ Res 2006;100:139-49. Chan CC, Shie RH, Chang TY, Tsai DH. Workers' exposures and potential health risks to air toxics in a petrochemical complex assessed by improved methodology. Int Arch Occup Environ Health 2006;79:135-42. ACGIH. 2016 Threshold limit values for chemical substances and physical agents & biliological exposure indices. Cincinnati: ACGIH worldwide; 2016. The National Institute for Occupational Safety and Health. NIOSH Manual of Analytical Methods; 2016. Available from: https://www.cdc.gov/niosh/nmam/default.html. [Last accessed on 2018 Feb 17]. USEPA. Integrated Risk Information System (IRIS). Available from: https://www.epa.gov/iris. [Last accessed on 2018 Feb 16]. RAIS. The Risk Assessment Information System. Available from: https://rais.ornl.gov/cgi-bin/prg/RISK_search?select=che. [Last accessed on 2018 Feb 17]. Ministry of Health and Medical Education of Iran (MHMEI). Occupational Exposure Limits. Tehran: Centre of Environmental & Occupational Health; 2015. IPCS. Environmental Health criteria, Human Exposure Assessment, Volume 214: World Health Organization; 2000. Available from: http://www.inchem.org/documents/ehc/ehc/ehc214.htm. [Last accessed on 2018 Feb 16]. Sexton K, Linder SH, Marko D, Bethel H, Lupo PJ. Comparative assessment of air pollution-related health risks in Houston. Environ Health Perspect 2007;115(Suppl10):1388-93. Kalabokas P, Hatzianestis J, Bartzis J, Papagiannakopoulos P. Atmospheric concentrations of saturated and aromatic hydrocarbons around a Greek oil refinery. Atmos Environ 2001;35(Suppl 14):2545-55. Bahrami A, Ansari M. Exposure of Sweepers to Volatile Organic Compounds Using Urinary Biological Exposure Index. J Res Health Sci 2007;7(Suppl 1):1-5. Bahrami A, Jonidi-Jafari A, Folladi B, Mahjub H, Sadri Q, Motamed Zadeh M. Comparison of urinary O-cresol and hippuric acid in drivers, gasoline station workers and painters exposed to toluene in west of Iran. Pak J Biol Sci 2005;8(Suppl 7):1001-5. Bahrami AR, Joneidi Jafari A, Ahmadi H, Mahjub H. Comparison of benzene exposure in drivers and petrol stations workers by urinary trans, trans-muconic acid in west of Iran. Ind health 2007;45(Suppl 3):396-401. Beall C, Delzell, E, Rodu B, Sathiakumar N, Lees PS, Breysse PN, et al. Case-control study of intracranial tumours among employees at a petrochemical research facility. J Occup Environ Med 2001;43:1103-13. Liu CC, Chen CC, Wu TN, Yang CY. Association of brain cancer with residential exposure to petrochemical air pollution in Taiwan. J Toxicol Environ Health 2008;71:310-4. Barregard L, Holmberg E, Sallsten G. Leukemia incidence in people living close to an oil refinery. Environ Res 2009;109:985-90.